A while back, Professor Adam Lankford (Department of Criminology & Criminal Justice, University of Alabama) sent me an open letter to the media and asked if I would sign my name to it. I, along with 146 other scholars, agreed. Don’t use photos or likenesses of the perpetrator. Stop using the names, photos, or likenesses of past perpetrators. Report everything else about these crimes in as much detail as desired. 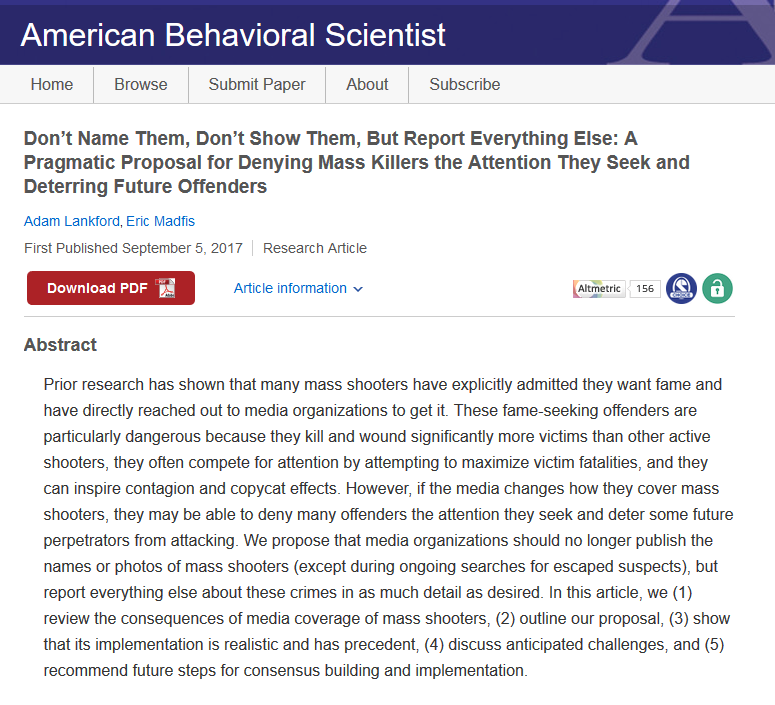 The release of this letter after the Las Vegas massacre is timely, but it also follows the publication of a paper by Lankford and Eric Madfis (University of Washington-Tacoma) in the American Behavioral Scientist explaining the scholarly basis for the letter. We are scholars, professors, and law enforcement professionals who have collectively studied mass shooters, school shooters, workplace shooters, active shooters, mass murderers, terrorists, and other perpetrators of crime. We agree—and believe you will as well—that the particular sequence of letters that make up offenders’ names, and the particular configuration of bones, cartilage, and flesh that make up offenders’ faces are among the least newsworthy details about them. That information itself tells us nothing, and has no inherent value. However, by reporting everything else about these crimes in as much detail as desired, you can continue to fulfill your responsibility to the public. As scholars, professors, and law enforcement professionals, we do not agree on everything. Some of us believe that by denying mass shooters fame, we would deter some future fame-seekers from attacking. Some of us believe that by no longer creating de facto celebrities out of killers, we would reduce contagion and copycat effects. Some of us believe that by no longer rewarding the deadliest offenders with the most personal attention, we would reduce the competition among them to maximize victim fatalities. However, all of us agree that it is important to stop giving fame-seeking mass shooters the personal attention they want. This sentiment has already been echoed by many members of the United States government, the law enforcement community, and the media itself. We recognize that there are exceptional cases, such as during the search for an escaped suspect, when the publication of that individual’s name and image may be temporarily necessary. However, we believe that in the vast majority of cases, the media can easily adhere to the guidelines stated above. There is already precedent for this approach: the media typically does not broadcast fans who run on the field during professional sporting events, does not publish the names of sexual assault victims, and does not publish the names of underage mass shooters who attack in Canada, where such information is already kept confidential. We hope that as members of the media, you are ready to take a stand, adopt the measures listed above, and encourage your colleagues to do the same. The costs would be minimal, and the benefit is that you could literally save lives. Tags: Mass Murders, mass public shootings, mass shootings. Bookmark the permalink. Previous post ← The Right to Keep and Bear as MANY Arms as You Want? And please, stop calling shooters “snipers”. Snipers are trained professionals. Most of the time, shooters are merely “kooks with a rifle”, generally a .22LR because they cannot hit with any other caliber as they are unskilled shooters. Indeed, this guy was more like Col. Dyer’s machine gunner, ordered to shoot fish in a barrel at Jallianwala Bagh, which is what I thought of on reading about this Monday. He was no sniper. Charles Whitman was closer to what one would call a sniper and had the USMC training, IIRC. Correction. Dyer couldn’t get the machine guns to bear on the victims as they were on armored cars and unavailable. If you consider the .223/5.56mm as a “.22” rifle, yes. But it is the most common arm used in these sorts of shootings and is also the current, standard NATO combat calilber. True snipers are, indeed, trained. But in the public mind, anyone who shoots from a high, usually concealed spot is a sniper. The Texas tower shooter actually sniped his targets, and this guy pretty much “sprayed and prayed” as the saying goes. The use of rifles equipped with “bump-fire” or “slide-fire” stocks obviates real aimed fire – unless they are used in the semi-=auto setting. And if they are used this way, they are even less useful, serving no purpose. I would say a device like this in the hands of a skilled shooter firing short, controlled bursts – as we were taught to use any FA weapon – could actually achieve aimed fire. One quibble, most mass shootings involve primarily handguns. Other than that no quibbles. If only the media would listen. If they must be referred to even when unnamed, by anything other than location, don’t give them “cool” or “scary” nicknames, be actively insulting and derogatory. They aren’t around to be offended and I really don’t care about their family’s feelings. For some time now – beginning, I think, with Newtown – I have not used the names of the shooters, identifying them by the location of their crimes. I do not want, by my words, to add to whatever notoriety they will get from the media. I applaud this open letter and agree with it completely. Col.Dave Grossman talks about this as well. Don’t give the next potential mass killer motivation to become famous in the only way available to him. Leave him as anonymous and irrelevant as his life’s accomplishments deserve. While I also agree completely were up against “If it bleeds it leads.” and that goes back a long ways in print journalism.